Accepted Scientific Name: Neobuxbaumia euphorbioides (Haw.) Buxb. Origin and Habitat: Neobuxbaumia euphorbioides is endemic to Mexico, and is distributed in the states of Tamaulipas and Veracruz. Also in extreme eastern San Luis Potosi and possibly northeastern Hidalgo and Puebla. Most likely, there are two disjunct populations, one south of Jalapa in Veracruz and near Mante in Tamaulipas. Estimated extent of occurrence of 10,000 km2 and an area of occupancy of 68 km2, is known from eight locations, and is experiencing continuing habitat loss. Altitude range. 300 to 600 metres above sea level. Habitat and Ecology: The species is found in low dry forest . It is unknown if this species tolerates human disturbance. In the Gómez Farias region in the state of Tamaulipas, Neobuxbaumia euphorbioides is reported as dominant in low dry forest habitat. This species is threatened by deforestation for small-holder agriculture and cattle. In the forests below Jalapa, Veracruz, N. euphorbioides grows on basaltic rock (it appears to join Neobuxbaumia scoparia in growing on basalts or other volcanics) in an area where the larger individuals had been cut down. The roughness (and high temperatures) of this surface probably discourage goats from frequenting, and the ever-regenerating canopy of this very moist area provides the necessary shade to guarantee recruitment. Neobuxbaumia euphorbioides f. cristata hort. Rooksbya euphorbioides f. cristata hort. 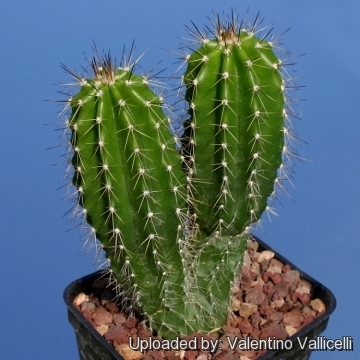 Description: Neobuxbaumia euphorbioides is a grey green very tall but relatively thin rarely if ever branching columnar cactus that can grow up to 15 cm in diameter and to a height of about 7 m, but is usually shorter. Derivation of specific name. As ages, spines tend to fall out and plant somewhat resembles a large columnar euphorbia (spurge) when not in bloom, hence the specific name. Stems: Columnar, usually simple unbranched, (except where it has been injured), green, 3-5 (or more) m high, 10-11 cm in diameter. Ribs: 8-10, acute, somewhat crenate, distinctly wavy. Areoles: less than 1 cm. apart, white felted. Spines; few, sometimes only 4 or 5, and then only 1 prominent, dark brown, porrect, about 1 cm. long. 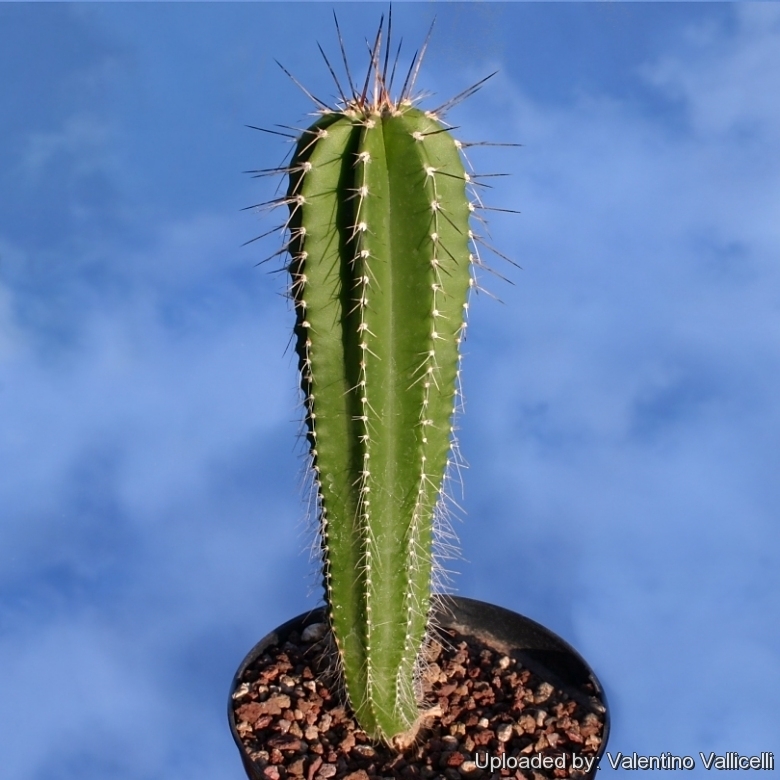 Spines: O two types, spines in the fertile region erect, elsewhere more or less horizontal. Central spines: One, stout, dark brown, to 3 cm long. Radial spines: 7-9 spines per areole. They are pale grey with darker reddish-brown to blackish tips, 0.5-1.2 cm long. Flowers: Numerous, from the sides near the apex, reddish pink, narrowly bell shaped 5-8 cm long, 7 cm in diameter and ruffled pink-red with a pale yellow centre. Ovary 2 cm. long, spirally tuberculate. The tubercles (podaria) of the pericarpel in Neobuxbaumia euphorbioides and Neobuxbaumia scoparia are specialized as extrafloral nectaries  and bears small triangular scales sparingly woolly in their axils, with 1 to 4 yellow spines. Perianth-tube funnelform, campanulate, 4.5 cm. long; outer perianth-segments 15 mm. long, fleshy, reflexed, brown or reddish brown, the inner ones 2 cm. long, reflexed, rose-red. Fruits: Green, to 6 cm long, that, when ripe, flare open like stars into five large segments to reveal the plant's juicy, seed-laden pulp. Similar species: Neobuxbaumia polylopha is very similar in its habit and flowers to this species. 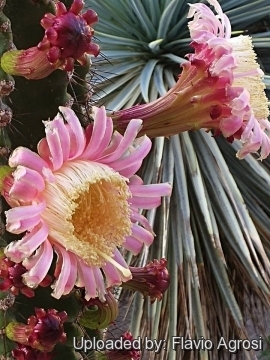 Superficially Neobuxbaumia euphorbioides resembles a straight stalk of the far more common Stenocereus griseus and is not recognized locally as a distinct species. 4) Gómez-Hinostrosa, C. & Hernández, H.M. 2013. Neobuxbaumia euphorbioides. The IUCN Red List of Threatened Species 2013: e.T151979A583374. http://dx.doi.org/10.2305/IUCN.UK.2013-1.RLTS.T151979A583374.en. Downloaded on 13 February 2016. Cultivation and Propagation: Neobuxbaumia are of easy culture and can grow 15-20 cm a year. They are cold intolerant. Make sure they are not exposed to freezing temperatures ( Hardy to -2°C) or they may die. They need a well drained soil mix. It appreciates abundant water during the summer and, during its growing period but allow to dry fully before watering again, it is possible to add a fertilizer 6-6-18 from time to time. During the winter months they should be rather kept dry. Since they are rapid growers, they need plenty of space for their roots. Repotting should be done every other year, or when the plant has outgrown its pot. Sun Exposure: Light shade when young, full sun later. In mild climate they can be grown in rock gardens in full sun, in dry and sandy soils. Uses: Neobuxbaumia euphorbioides has edible fruits.